ISLAMABAD, Aug 11 (APP): Minister for IBNH Senator Pervaiz Rashid on Thursday said that Pakistan needs politics of generator to ensure progress and prosperity of the future generation. He was speaking as chief guest at an event, marking second anniversary of the launch of Vision 2025 and Young Development Leaders Awards. He said that Pakistan did not need politics of container which would contain the nation’s journey towards progress and prosperity. Earlier, he distributed awards among the personalities who have contributed in sectors of energy, education, arts and culture, health, engineering, IT, community services, entrepreneurship, innovations, science, bio-technology and emerging sciences. 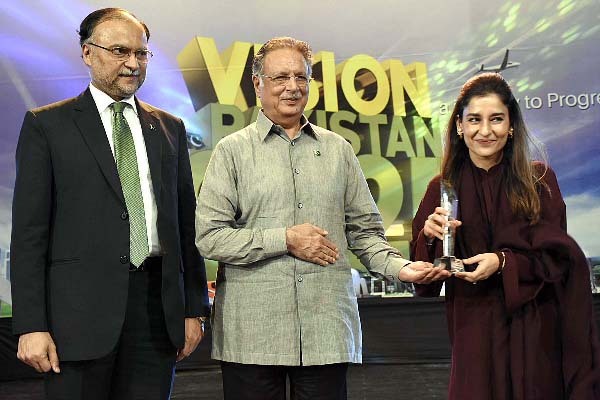 Pervaiz Rashid along with Minister for Planning Ahsan Iqbal inaugurated the digital campaign of Vision 2025.